"Astigmatic" redirects here. For the album, see Astigmatic (album). For the more general class of optical aberrations, see Astigmatism (optical systems). In Europe and Asia astigmatism affects between 30 and 60% of adults. People of all ages can be affected. Astigmatism was first reported by Thomas Young in 1801. Although astigmatism may be asymptomatic, higher degrees of astigmatism may cause symptoms such as blurry vision, double vision, squinting, eye strain, fatigue, or headaches. Some research has pointed to the link between astigmatism and higher prevalence of migraine headaches. With-the-rule astigmatism – the vertical meridian is steepest (a rugby ball or American football lying on its side). Against-the-rule astigmatism – the horizontal meridian is steepest (a rugby ball or American football standing on its end). Oblique astigmatism – the steepest curve lies in between 120 and 150 degrees and 30 and 60 degrees. Irregular astigmatism – principal meridians are not perpendicular. In against-the-rule astigmatism, a plus cylinder is added in the horizontal axis (or a minus cylinder in the vertical axis). Irregular astigmatism, which is often associated with prior ocular surgery or trauma, is also a common naturally occurring condition. The two steep hemimeridians of the cornea, 180° apart in regular astigmatism, may be separated by less than 180° in irregular astigmatism (called nonorthogonal irregular astigmatism); and/or the two steep hemimeridians may be asymmetrically steep—that is, one may be significantly steeper than the other (called asymmetric irregular astigmatism). 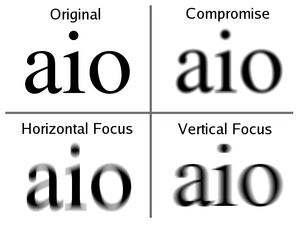 Irregular astigmatism is quantified by a vector calculation called topographic disparity. Simple hyperopic astigmatism – first focal line is on the retina, while the second is located behind the retina. Simple myopic astigmatism – first focal line is in front of the retina, while the second is on the retina. Compound hyperopic astigmatism – both focal lines are located behind the retina. Compound myopic astigmatism – both focal lines are located in front of the retina. 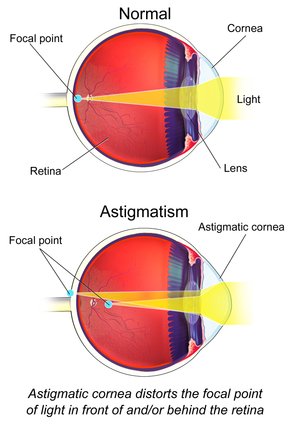 Astigmatism, whether it is regular or irregular, is caused by some combination of external (corneal surface) and internal (posterior corneal surface, human lens, fluids, retina, and eye-brain interface) optical properties. In some people, the external optics may have the greater influence, and in other people, the internal optics may predominate. Importantly, the axes and magnitudes of external and internal astigmatism do not necessarily coincide, but it is the combination of the two that by definition determines the overall optics of the eye. The overall optics of the eye are typically expressed by a person's refraction; the contribution of the external (anterior corneal) astigmatism is measured through the use of techniques such as keratometry and corneal topography. One method analyzes vectors for planning refractive surgery such that the surgery is apportioned optimally between both the refractive and topographic components. Laser eye surgery (LASIK and PRK) is successful in treating astigmatism. According to an American study nearly three in 10 children (28.4%) between the ages of five and 17 have astigmatism. A recent Brazilian study found that 34% of the students in one city were astigmatic. Regarding the prevalence in adults, a recent study in Bangladesh found that nearly 1 in 3 (32.4%) of those over the age of 30 had astigmatism. A Polish study published in 2005 revealed "with-the-rule astigmatism" may lead to the onset of myopia. A number of studies have found the prevalence of astigmatism increases with age. As a student, Thomas Young discovered that he had problems with one eye in 1793. In the following years he did research on his vision problems. He presented his findings in a Bakerian Lecture in 1801. Independent from Young, George Biddell Airy discovered the phenomenon of astigmatism on his own eye. Airy presented his observations on his own eye in February 1825 at the Cambridge Philosophical Society. Airy produced lenses to correct his vision problems by 1825, while other sources put this into 1827 when Airy obtained cylindrical lenses from an optician from Ipswich. The name for the condition was not given by Airy, but from William Whewell. By the 1860s astigmatism was a well established concept in ophthalmology, and chapters in books described the discovery of astigmatism. ^ a b c d e f g h i j k l m "Facts About Astigmatism". NEI. October 2010. Archived from the original on 2 October 2016. Retrieved 29 September 2016. ^ a b Harvey, EM (June 2009). "Development and treatment of astigmatism-related amblyopia". Optometry and Vision Science. 86 (6): 634–9. doi:10.1097/opx.0b013e3181a6165f. PMC 2706277. PMID 19430327. ^ a b c d Read, SA; Collins, MJ; Carney, LG (January 2007). "A review of astigmatism and its possible genesis". Clinical & Experimental Optometry. 90 (1): 5–19. doi:10.1111/j.1444-0938.2007.00112.x. PMID 17177660. ^ a b c Mozayan, E; Lee, JK (July 2014). "Update on astigmatism management". Current Opinion in Ophthalmology. 25 (4): 286–90. doi:10.1097/icu.0000000000000068. PMID 24837578. ^ "Thomas Young | British physician and physicist". Encyclopedia Britannica. Archived from the original on 29 August 2017. Retrieved 28 August 2017. ^ "Astigmatism". MedicineNet. OnHealth.com. Archived from the original on 2 July 2013. Retrieved 8 September 2013. ^ Harle, Deacon E.; Evans, Bruce J. W. (2006). "The Correlation Between Migraine Headache and Refractive Errors". Optometry and Vision Science. 83 (2): 82–7. doi:10.1097/01.opx.0000200680.95968.3e. PMID 16501409. ^ a b c Gilbert Smolin; Charles Stephen Foster; Dimitri T. Azar; Claes H. Dohlman (2005). Smolin and Thoft's The Cornea: Scientific Foundations and Clinical Practice. Lippincott Williams & Wilkins. pp. 173–. ISBN 978-0-7817-4206-1. ^ Carlo Cavallotti; Luciano Cerulli (31 May 2008). Age-Related Changes of the Human Eye. Springer Science & Business Media. pp. 49–. ISBN 978-1-59745-507-7. ^ Bogan, SJ; Waring Go, 3rd; Ibrahim, O; Drews, C; Curtis, L (1990). "Classification of normal corneal topography based on computer-assisted videokeratography". Archives of Ophthalmology. 108 (7): 945–9. doi:10.1001/archopht.1990.01070090047037. PMID 2369353. ^ Alpins, NA (1998). "Treatment of irregular astigmatism". Journal of Cataract and Refractive Surgery. 24 (5): 634–46. doi:10.1016/s0886-3350(98)80258-7. PMID 9610446. ^ Alpins, NA (1997). "New method of targeting vectors to treat astigmatism". Journal of Cataract and Refractive Surgery. 23 (1): 65–75. doi:10.1016/s0886-3350(97)80153-8. PMID 9100110. ^ Alpins, NA (1997). "Vector analysis of astigmatism changes by flattening, steepening, and torque". Journal of Cataract and Refractive Surgery. 23 (10): 1503–14. doi:10.1016/s0886-3350(97)80021-1. PMID 9456408. ^ "Keratometry". St. Luke's Cataract & Laser Institute. Archived from the original on 29 October 2013. Retrieved 8 September 2013. ^ Graff, T (1962). "Control of the determination of astigmatism with the Jackson cross cylinder". Klinische Monatsblätter für Augenheilkunde und für Augenärztliche Fortbildung. 140: 702–8. PMID 13900989. ^ Del Priore, LV; Guyton, DL (1986). "The Jackson cross cylinder. A reappraisal". Ophthalmology. 93 (11): 1461–5. doi:10.1016/s0161-6420(86)33545-0. PMID 3808608. ^ Brookman, KE (1993). "The Jackson crossed cylinder: Historical perspective". Journal of the American Optometric Association. 64 (5): 329–31. PMID 8320415. ^ "Introduction to Refraction". Nova Southeastern University. Archived from the original on 10 September 1999. Retrieved 8 September 2013. ^ Boyd, Benjamin F. (2011). Modern Ophthalmology The Highlights. Panama: Jaypee Brothers Medical Pub. p. 388. ISBN 9789962678168. Archived from the original on 15 January 2016. ^ Azar, Dimitri T. (2007). Refractive surgery (2nd ed.). Mosby Elsevier. ISBN 9780323035996. ^ Kleinstein, R. N.; Jones, LA; Hullett, S; et al. (2003). "Refractive Error and Ethnicity in Children". Archives of Ophthalmology. 121 (8): 1141–7. doi:10.1001/archopht.121.8.1141. PMID 12912692. ^ Garcia, Carlos Alexandre de Amorim; Oréfice, Fernando; Nobre, Gabrielle Fernandes Dutra; Souza, Dilene de Brito; Rocha, Marta Liliane Ramalho; Vianna, Raul Navarro Garrido (2005). "Prevalence of refractive errors in students in Northeastern Brazil". Arquivos Brasileiros de Oftalmologia. 68 (3): 321–5. doi:10.1590/S0004-27492005000300009. PMID 16059562. ^ Bourne, R; Dineen, BP; Ali, SM; Noorul Huq, DM; Johnson, GJ (2004). "Prevalence of refractive error in Bangladeshi adults*1Results of the National Blindness and Low Vision Survey of Bangladesh". Ophthalmology. 111 (6): 1150–60. doi:10.1016/j.ophtha.2003.09.046. PMID 15177965. ^ Czepita, D; Filipiak, D (2005). "The effect of the type of astigmatism on the incidence of myopia". Klinika Oczna. 107 (1–3): 73–4. PMID 16052807. ^ Asano, Kazuko; Nomura, Hideki; Iwano, Makiko; Ando, Fujiko; Niino, Naoakira; Shimokata, Hiroshi; Miyake, Yozo (2005). "Relationship Between Astigmatism and Aging in Middle-aged and Elderly Japanese". Japanese Journal of Ophthalmology. 49 (2): 127–33. doi:10.1007/s10384-004-0152-1. PMID 15838729. ^ Coggin, David (1893). "Notes on the Centennial Anniversary of the Discovery of Astigmatism". Boston Med Surg J. 128 (6): 136–137. doi:10.1056/NEJM189302091280603. ^ Atchison, David A; Charman, W Neil (2011). "Thomas Young's contributions to geometrical optics". Clinical and Experimental Optometry. 94 (4): 333–340. doi:10.1111/j.1444-0938.2010.00560.x. PMID 21214628. ^ Thomas Young (1801). "Philosophical transactions of the Royal Society of London". Philosophical Transactions of the Royal Society of London. 91: 23–88. doi:10.1098/rstl.1801.0004. Archived from the original on 7 November 2016. ^ a b Levene, J. R. (1966). "Sir George Biddell Airy, F.R.S. (1801-1892) and the Discovery and Correction of Astigmatism". Notes and Records of the Royal Society of London. 21 (2): 180–199. doi:10.1098/rsnr.1966.0017. JSTOR 531067. ^ Wang, Ming (22 October 2007). Irregular Astigmatism: Diagnosis and Treatment. ISBN 9781556428395. Archived from the original on 28 October 2016. ^ George Biddell Airy (1827). "On a peculiar Defect in the Eye, and a mode of correcting it". Transactions of the Cambridge Philosophical Society. Archived from the original on 28 October 2016. ^ Read, Scott A; Collins, Michael J; Carney, Leo G (2007). "A review of astigmatism and its possible genesis". Clinical and Experimental Optometry. 90 (1): 5–19. doi:10.1111/j.1444-0938.2007.00112.x. PMID 17177660. ^ Porter, Jason (2006). Adaptive optics for vision science: principles, practices, design, and applications. ISBN 9780471679417. Archived from the original on 28 October 2016. ^ Wood, Alexander; Oldham, Frank (1954). Thomas Young Natural Philosopher 1773-1829. Archived from the original on 28 October 2016. ^ Donders, Franciscus Cornelis (1866). Die Anomalien der Refraction und Accommodation des Auges. Archived from the original on 28 October 2016. ^ Wang, Ming (22 October 2007). Irregular Astigmatism: Diagnosis and Treatment. ISBN 9781556428395. Archived from the original on 29 June 2011. ^ Snyder, C. (1965). "The Rev. Mr. Goodrich and His Visual Problem" (PDF). Archives of Ophthalmology. 73 (4): 587–589. doi:10.1001/archopht.1965.00970030589023. Archived (PDF) from the original on 6 March 2012. ^ Bumstead, J. F. (1863). "A Few Remarks on Astigmatism". Boston Med Surg J. 69 (14): 280–284. doi:10.1056/NEJM186311050691404. ^ Donders, Franciscus C (1862). Astigmatismus und cylindrische Gläser. Archived from the original on 6 November 2016. ^ Artal, Pablo; Tabernero, Juan (2010). "Optics of human eye: 400 years of exploration from Galileo's time". Applied Optics. 49 (16): D123–30. Bibcode:2010ApOpt..49G.123A. doi:10.1364/AO.49.00D123. PMID 20517354. Look up astigmatism in Wiktionary, the free dictionary.